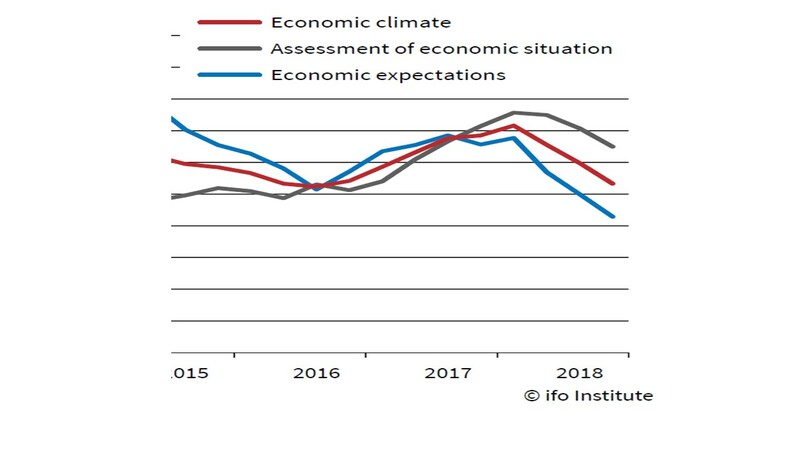 Caption: In the EU, the current state of the economy, and expectations for the near-term future, have both turned down sharply since the beginning of 2018. I regularly respond to a questionnaire from Ifo – Institute for Economic Research, based in Munich. Ifo regularly surveys economists and business leaders around the world, to put a hand on the pulse of the global economy. There are major problems in Italy and Spain. Italy’s new right-wing government is quarreling with the European Commission. Spain is showing signs of instability. In Germany, Chancellor Angela Merkel announced she will not run again for the leadership of her party, and may possibly resign as Chancellor by year’s end. Hungary is muzzling the press and its judiciary. China’s economic growth is slowing, and the renminbi (yuan) is touching 7 to the dollar. In tomorrow’s election, the US may find itself with a split Congress – Democratic House, Republican Senate. The US stock markets had their worst month in years. The world is now paying for neglecting countries, and wage-earners, who were left out of global growth and wealth creation. Migration has destabilized Europe, the Mideast and to some extent, the US. If wealth does not come to a country, and if it is not distributed well, many people in that country will flee toward the wealth. And when they do, the resulting instability will put a deep dent in wealthy economies. « Are You Trapped in the Tunnel of Scarcity?